Since 2013, REPT has provided financial support to enable a summer camp to be run during the annual school break in July/August, accommodating 30 to 40 participants. We believe very strongly in the concept of the summer camp and we see the tremendous value that the participants derive from their camp experience. We are proud to be able to encourage and support this enriching initiative. Although it is for a short period of time only, it is such a good thing for children to be in an environment where they are valued, where they take initiative, where they learn that nothing happens if you sit back and wait for someone else to act. Learning how to take the lead essentially teaches youth how to be good citizens. In Burkina Faso, “The Country of Honourable People” ( Burkina in Moore means “men of integrity” and Faso in Djoula means “fatherland” ) – this means a lot. The summer camp is organized and run by one of our local partners – Benoit Rouamba. In addition to working with REPT in Canada, Benoit has ties with other charitable organizations in Switzerland and France. The summer camp is the result of a collaborative effort and participation by all of these groups who have the best interests of children at heart. The original idea for the camp was to plant trees on land made available by the local community, just outside of Hounde and this has remained an area of focus for the camp in subsequent years. Between 450 and 1000 trees – including teak, mango, melinas and avocado, are planted every summer. Over the years the organizers have become very knowledgeable in this field and the recent success rate of the planting is impressive. playing in the fields and running up the tree covered hills. Every day is an opportunity to explore, discover and grow. The children learn how to work, play, relate, get along, empathize and connect with others. The overall supervision of the camp is the responsibility of Benoit however, since this period at camp is considered an opportunity for some of the older camp participants to develop their own leadership skills, much of the day-to-day running of the camp is left to them. From 2013-2015, a group of adolescent scouts from Switzerland joined the camp and were responsible for organizing activities and mentoring the children. 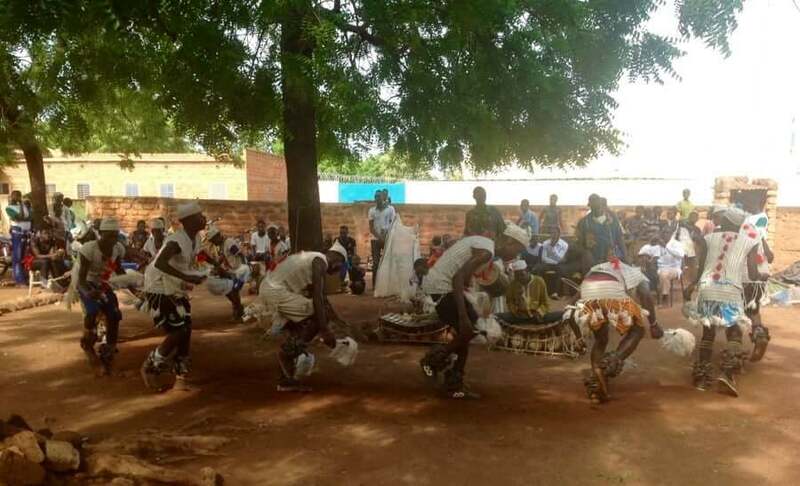 In 2016, young adult students from Ouagadougou organized most of the activities, and they also were able to give educational support courses for all the children. In 2016, young adult women from Hounde (14 to 18 years) took over the kitchen and were responsible for all meals. The older children benefit greatly from their experience. They are engaged, focused and involved in making the camp work. They are responsible and competent. They are outside all day and they are active.